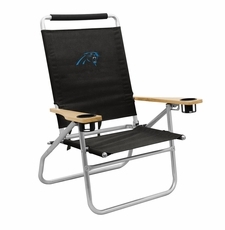 Sit back, relax and watch the tide roll in your NFL Team Seaside Beach Chair. Enjoy three reclining positions and padding for your head. Dual cup holders are situated in wooden armrests. Features primary team color fabric with screenprinted logo. Folds flat for convenient storage and easy transportation with the shoulder strap. Aluminum frame makes it really lightweight. Dimensions: 22" x 29" x 36"